My littlest man turned TWO last week. I still don't know how this is possible, but it happened. 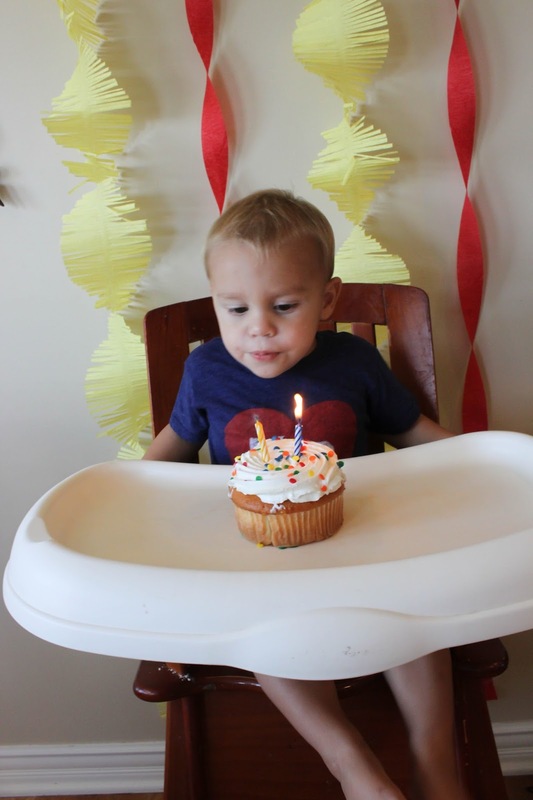 A few months ago, my head was swimming with all the magical plans I had for his second birthday party. He has been attached to his Curious George Monkey and Tum Tum Monkey the last several months (he will not go to sleep unless he has both). I could imagine the sheer excitement on his face if we threw him a Curious George themed birthday party. I had been pinning amazing ideas, and could not wait to start working on it. Life has been particularly busy since school started back into session. I've been pouring a lot of time and energy into getting ready for MOPS (Mothers of Preschoolers), as I'm one of a five person team who plans the entire year. I kept thinking I needed to set time aside to plan, and time just kept getting away from me. Next thing I know, I'm getting text messages from family asking when Judson's party would be. As I looked at my calendar, I realized I had one week until his birthday. How did this happen? My dreams of the perfect Curious George party quickly began to fade. I set a date for his party, and now no longer had time to order anything. So, I headed to my local party store and realized they do not carry anything Curious George at all. Well, it was time for plan B. I ended up going with Mickey Mouse. Jack and Judson love Mickey Mouse Clubhouse. They ask to watch it everyday. So, I got some Mickey balloons and a birthday banner. I normally make a fun cake (that I copy from someones Pinterest creation). However, the thought of making a gigantic mess in my kitchen and spending hours upon hours getting it just so, just didn't sound as appealing. I surprised myself as I drove to Costco. 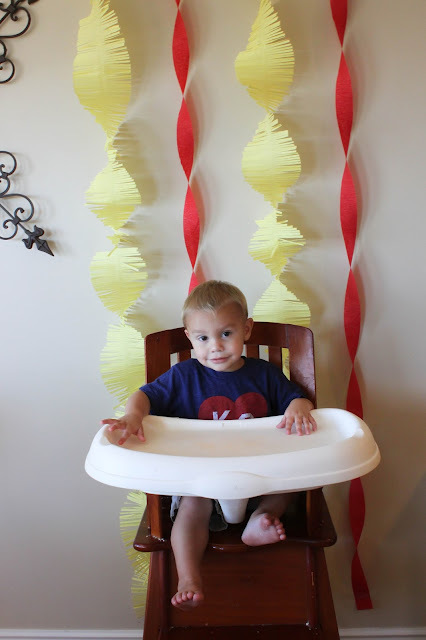 Am I really forgoing the "Pinterest inspired" birthday party this year? I felt a bit of guilt, like I wasn't giving Judson my best. I arrived at Costco, and they had the most amazing, massively large cupcakes. Iced in white with the perfect shade of red, yellow, and blue sprinkles. They would go perfect with the Mickey Mouse decorations! I headed home and unloaded the party supplies and cupcakes. My job was done. I actually had time to relax and spend time with my family, instead of being my normal party planning stressed out self. The day of the party, I went on a long run. Seriously, I had time to do other things! I hung the banner minutes before the family arrived. I had some red and yellow streamers that I already had on hand, that I put up behind Judson's chair, and called it good. And you know what, we had a great time. Judson was celebrated. I enjoyed visiting with family and I was able to be 100% present. No rushing around, panicked and stressed. I just simply enjoyed watching my little man at his 2nd birthday party, and loved watching him want to blow out his candles again and again! The guilt of "not giving Judson my best" quickly faded as I realized I was giving him by best, by being a happy and fun to be around mommy on his special day. I learned a valuable lesson that day. The saying, "sometimes less is more," really is true. I spent less money, and less time planning, preparing, and stressing about this day. In return, I enjoyed myself so much more. When you think of the purpose of a birthday party, it's to celebrate the one having a birthday. That is what we did. He was celebrated just as much as if I would have had an amazing detailed Pinterest worthy party. When I think back to various parties we've thrown for the boys over the years, I don't ever remember them saying, "Mom, remember my Spider Man birthday party?" They just don't bring that up. I think its safe to say, the celebrating is all they care about. Not, the endless amazing and intricate details. I think that as moms it is easy for us to get caught up in those details and wrapped up in the hype of creating the perfect Pinterest worthy party, that somewhere along the way it becomes less and less about the birthday boy or girl and more about how cool of a party can I throw? The stress of all the planning and all the details can really take the fun out of celebrating the birthday boy or girl. I'm going to remind myself of this "Less is More" principle in a few months as Cooper's birthday approaches. Choose Joy and Celebrate!